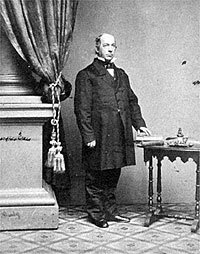 Secretary of the Interior (1861-63), Caleb B. Smith was the Chairman of the Indiana Republican delegation at the Chicago Republican National Convention in 1860 who seconded Mr. Lincoln’s nomination. His selection fulfilled an obligation unfortunately incurred by Lincoln’s managers in Chicago but provided little else to recommend it. Mrs. Lincoln opposed Illinois politician Norman Judd for the post and Mr. Lincoln told Indiana’s Schuyler Colfax that he would rather have Colfax in Congress. Mary Todd Lincoln told her friend Orville Browning in December 1862 that Mr. Lincoln wanted to replace Smith—perhaps with Browning. 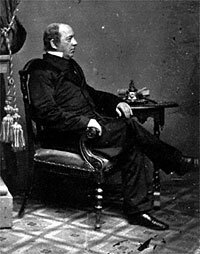 Smith himself shared with Browning a different ambition—appointment to the Supreme Court. “Essentially a spellbinding party orator and jobbing politician, always indolent and now actually in poor health, Smith had little taste for his Cabinet job,” wrote Lincoln biographer Reinhold Luthin. “He hoped that Lincoln would elevate him to the United States Supreme Court, since geographically he was eligible, he thought. Secretary Smith inspired his friends in Congress to work for a law that would so ‘gerrymander’ the federal judicial circuits so as to make him eligible for the nation’s highest tribunal (United States Supreme Court justices also sat on circuit) without interfering with the ambitions of Senator Browning…”4 Instead, the appointment went to Mr. Lincoln’s former legal colleague, David Davis, whom Smith had tried maneuver into a Court of Claims judgeship. 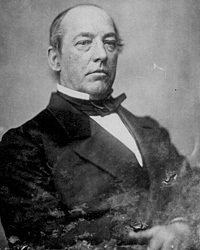 Smith was similarly ineffective in one of his other responsibilities—western Indian problems, which were badly handled by his agents in Minnesota. Smith resigned for medical reasons in December 1862 to become a U.S. District Court Judge in Indiana. He died shortly thereafter. Nelson Loomis, “President Lincoln’s Cabinet.” p. 7 (from James G. Blaine, Twenty Years in Congress). Willard L. King, Lincoln’s Manager David Davis, p. 204. Michael Burlingame, The Inner World of Abraham Lincoln, pp. 302-303. Reinhold H. Luthin, The Real Lincoln, p. 361. David M. Silver, Lincoln’s Supreme Court, p. 73-74. Rufus Rockwell Wilson, editor, Intimate Memories of Lincoln, p. 379. Michael Burlingame,Abraham Lincoln: A Life, Volume I, pp. 739-740, Volume II, p. 54.